Up until now, we've always used links (GET) and HTML forms (POST) to get data from the ESP, or to send data to it. This always resulted in a browser navigation action. There are many situations where you want to send data to the ESP without refreshing the page. One way to do this is by using AJAX and XMLHTTP requests. The disadvantage is that you have to establish a new TCP connection for every message you send. This adds a load of latency. WebSocket is a technology that keeps the TCP connection open, so you can constantly send data back and forth between the ESP and the client, with low latency. And since it's TCP, you're sure that the packets will arrive intact. To learn how to use WebSockets, I created this comprehensive example, it uses pretty much everything we've covered so far. 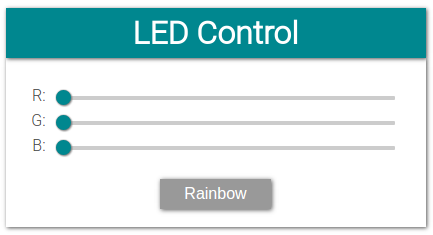 The ESP hosts a webpage with three sliders to set the red, green and blue levels of an RGB LED (or LED strip). There's also a button to turn on a rainbow effect that cycles through the entire color wheel. Color data is transmitted from the browser to the ESP via a WebSocket connection. You can connect to the ESP directly, using it as an AP, or let the ESP connect to a different AP. You can use mDNS to open the webpage, by browsing to http://esp8266.local. 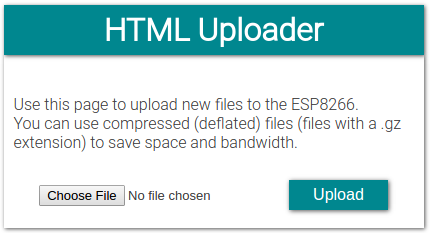 All files are stored in the ESP's SPIFFS, and you can upload new files, or update files via a web interface. You can also use the OTA service to upload new firmware (sketches) over Wi-Fi. When dealing with large and complicated programs, it's a good idea to make abstraction of some things, and create functions with a descriptive name instead of endless lines of meaningless code. Even if you have lots of comments in your code, it'll be very hard to preserve an overview. Using functions will greatly improve the readability of your code. So just split up the code into different parts and move all pieces to functions at the bottom of your sketch, or even to different files. In the following example, the setup was very long and cluttered, so I split it up into several different functions: one to connect to the Wi-Fi, one to start the OTA update service, one to start the SPIFFS ... and so on. You should already be familiar with most of this code. The only new part is the WebSocket server library that is included, and the WebSocket server object, but this shouldn't be a problem. As you can see, the setup is now much more condensed and gives a much better overview of what it's doing. To understand the program, you don't have to know each individual step that is required to connect to a Wi-Fi network, it's enough to know that it will connect to a Wi-Fi network, because that's what the startWiFi function does. Same goes for the loop: most of the work is done by the first three functions that handle the WebSocket communication, HTTP requests and OTA updates. When such an event happens, the appropriate handler functions will be executed. These are defined elsewhere. The second part is the rainbow effect. If it is turned on, it cycles through the color wheel and sets the color to the RGB LED. If you don't understand why I use millis(), you can take a look at the Blink Without Delay example. These are the function definitions of the functions used in the setup. Nothing new here, apart from the startWebSocket function. You just have to start the WebSocket server using the begin method, and then give it a callback function that is executed when the ESP receives a WebSocket message. This is the code that is executed on certain server-related events, like when an HTTP request is received, when a file is being uploaded, when there's an incoming WebSocket message ... etc. Again, most of the code is adapted from the previous examples, only the WebSocket part is new. Each color is a 10-bit number, so in total, it gives us a 30-bit number for the RGB value. We just create a WebSocket connection object to send data to the ESP. Then every time a slider is moved, we take the values of the three sliders and we square the color values to get a smoother and more natural curve. We then combine them into a 30-bit number (10 bits per color). Finally, the RGB value gets converted to a hexadecimal string, a '#' is added, and it's sent to the ESP. When the rainbow button is pressed, the sliders are disabled, and an 'R' is sent to the ESP. When the rainbow button is pressed again, the sliders are enabled, and an 'N' is sent. Back to the ESP8266 Arduino code again. We need some other functions as well, to convert bytes to KB and MB, to determine file types based on file extensions and to convert a hue angle to RGB values. To convert from hue to RGB, we use sines and cosines, because the sum of their squares is always one, so the total intensity will always be more or less the same. Download the example from GitHub and open it in the Arduino IDE. Then add your Wi-Fi credentials (lines 83-85). Connect an RGB LED with red to pin 15, green to pin 12 and blue to pin 13. Don't forget the current limiting resistors! Select the SPIFFS size (64KB should be enough, but if you want to upload more files later, you should set it higher). 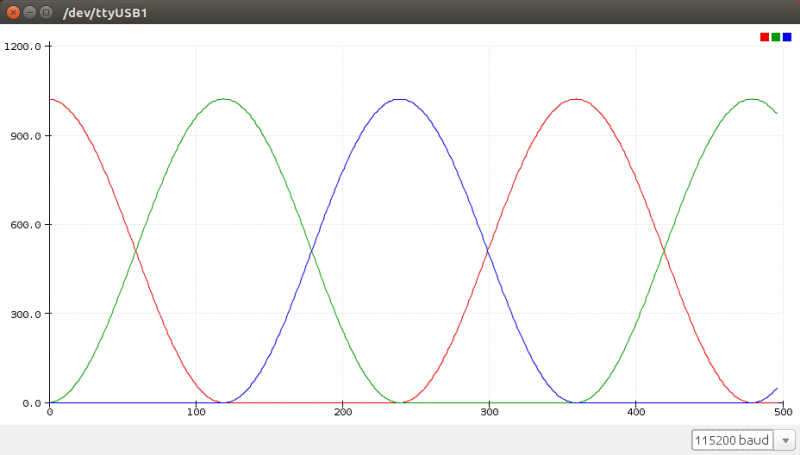 Upload the sketch over Serial, and then upload the SPIFFS files using Tools > ESP8266 Sketch Data Upload. Use the sliders to adjust the color levels of the LED, and press the Rainbow button to enable the rainbow effect.